As a non-invasive measuring point, the new model TR57-M pipe surface resistance thermometer from WIKA offers great versatility, e.g. for retrofitting or temporary fitting. The instrument, with its miniature design, can be fitted into extremely space-critical surroundings. 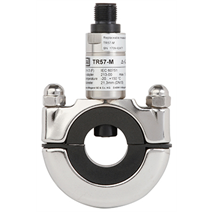 The model TR57-M is fixed to the pipeline using an adapter, with the electrical connection made via an M12x1 connector. A spring-loaded measuring insert ensures a constant contact for the probe with the surface. The probe tip is isolated against the ambient temperature by the silicon lining of the adapter. The new thermometer, with IP67 ingress protection, is designed for a measuring range of -20 °C … +150 °C. It can be supplied with a direct sensor output or an integrated transmitter. 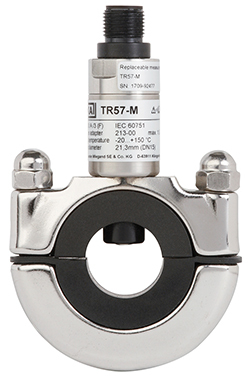 The measuring insert of the TR57-M can be removed for calibration.